How Much Will Philip Morris International Raise Its Dividend? Dividend investors are impatient for news from the global tobacco giant about how much they'll get going forward. Dividend investors know that tobacco stocks often make lucrative payouts, and Philip Morris International (NYSE:PM) stands among the highest-yielding large-cap stocks in the entire market. Every year in its history as a publicly traded company, Philip Morris has delivered a dividend increase to its shareholders, and it typically comes at this time of year. In its early years, Philip Morris International's dividend boosts were quite substantial, but in recent years, the amount of its increase has become much smaller. Because of that trend, investors are nervous about the tobacco company's imminent announcement about its payout, which some expect to come out later this week. Let's take a closer look at Philip Morris International's dividend history to try to guess about the size of a future dividend increase. What will Philip Morris International give shareholders? Early in its history as a separate company, Philip Morris wanted to demonstrate its commitment to shareholders not only by paying lucrative dividends but by raising them significantly each year. Within its first year as a publicly traded stock, Philip Morris gave investors a 17% raise in its quarterly payout. Even in 2009, which was rocked by fallout from the financial crisis, the tobacco giant managed to give shareholders a 7% increase. In subsequent years, double-digit percentage increases became the norm, with a range of 10% to 20% from 2010 to 2013. However, 2014 brought a new challenge that led Philip Morris to hold back its dividend growth: the strength of the U.S. dollar. Because Philip Morris does all of its business overseas, most of its revenue comes in the form of foreign currencies whose values don't move in lockstep with the U.S. dollar. As a result, revenue and earnings growth slowed and even turned negative during some periods. That led to smaller dividend increases from the company, with Philip Morris making a 6% boost in 2014 and a 2% rise in 2015. 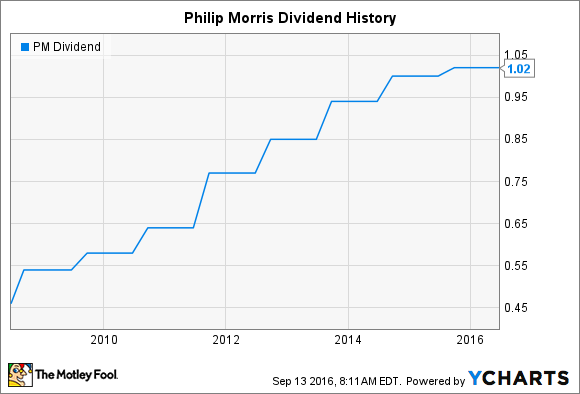 How much bigger can Philip Morris International's dividend get? As it looks to figure out how much to increase its dividend in 2016, Philip Morris will have to consider multiple factors. On one hand, the company has seen the downward pressure on its earnings from the strong dollar start to wane. During much of 2014 and 2015, Philip Morris had to deal with currency impacts that took away between $0.20 and $0.37 per share from its quarterly earnings. Toward the end of 2015, those pressures started to dissipate, and the two most recent quarters have seen the dollar's strength hit earnings by $0.18 and $0.08 per share respectively. One answer to the question of how big Philip Morris' dividend increase could be might come from its guidance changes with respect to currency impacts. Over the past six months, the tobacco giant has revised its guidance twice, pushing up its full-year estimates by a total of $0.20 per share due solely to more favorable currency trends. Giving all of that increase back to shareholders would result in a nickel-per-share rise in the quarterly payout to $1.07 per share. That wouldn't be a horrible result, although it would continue the ugly trend of single-digit percentage increases. Yet some skeptics think that even that size of increase might be too much. Currently, Philip Morris expects a full-year bottom line of $4.45 to $4.55 per share. A $1.07 per share quarterly dividend would work out to Philip Morris paying out between 94% and 96% of its earnings as dividends, and that's somewhat higher than the target that the company has typically sought. Another $0.02 per share increase would put Philip Morris' payout ratio at between 91% and 93% based on forward earnings projections, and the company might feel more comfortable with that conservative approach. In the end, what Philip Morris decides to do will depend a lot on whether the currency situation has continued to improve in recent months. If the company sees further earnings gains as likely, then it might choose to make a somewhat larger increase. In any event, investors shouldn't expect the double-digit percentage growth that they've enjoyed in the past until the dollar stops being a factor for Philip Morris.